In my opinion having a printer at home is a necessity. The amount of times we have had to print things off my parents printers was becoming a bit of a joke. 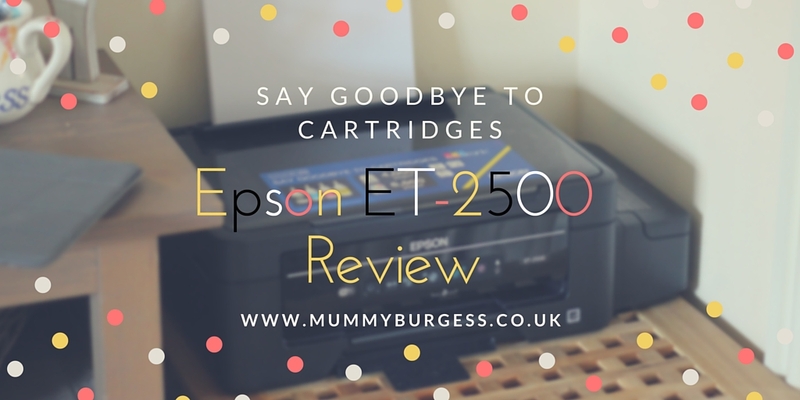 When I got the opportunity to review the new Epson ET-2500, I had to say yes. Then when I was informed that I was going to be saying goodbye to ink cartridges too, I leapt with joy. I detested our old printer, it ate (or drank... I'm not sure!!) through cartridges so quickly and I just couldn't justify the expense of constantly having to re-stock. But the Epson ET-2500 does away with this stress and claims that you only have to replace the ink once every two years. Intrigued? Then read on. This amazing printer has the EcoTank which can reduce the cost of printing by 70% and include two year's worth of ink in the box when purchased. The ink bottles included can print up to 4,000 pages in black and 6,500 pages in colour - part of me is thinking it's going to last longer than two years!!! The ink tank system completely does away with the need for ink cartridges, which means less fuss and more printing between refills than other inkjet printers. Another feature is mobile printing. Equipped with Wi-Fi, the ET-2500 can print quickly over Wi-fi from a smartphone (using the free Epson app) and of course wirelessly over other devices. This is a brilliant feature for a busy family like us with various devises. Setting up the printer was very easy. I was worried the tanks may be fiddly and messy to fill, but thankfully it was all very easy (and pretty mess free!). Printing is so easy, just turn on the wi-fi and you're good to go. I love the app too, I have managed to print quite a few things from my phone too when I've been too lazy to get my laptop out! For me this printer is absolutely perfect for our needs as a family. I can now get organised with my blogging finances by printing invoices, create reward charts, print pictures - and Darcie may have asked a fair few times for new colouring in pages! The printer retails at £229.99 but is currently £199.95 over on amazon . *Printer sent for the purpose of the review, all thoughts and opinions are my own. Post also contains an affiliate link.